According to Brad Biggs of the Chicago Tribune, Chicago Bears wide receiver Markus Wheaton is the favorite to land the Bears third WR job and will presumably play in the slot. Wheaton, who missed all but 28 snaps in 2016 to injury, signed with the team this offseason. 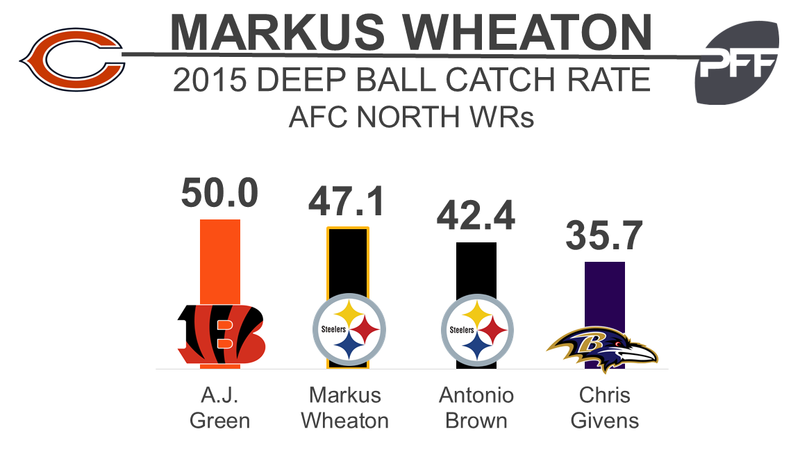 Wheaton performed at an average level for the Steelers throughout his four years there, earning a 74.1 overall grade in 2014 and a 73.4 overall grade in 2015. He was effective catching deep passes though, and in 2015, produced a deep ball catch rate of 47.1, 11th out of 62 receivers with at least 12 deep targets. Wheaton has experience playing both in the slot and outside. In 2015, he played in the slot for a career-high 67 percent of snaps (544). During that season, he produced the 20th-highest yards-per-route-run average from the slot out of 52 receivers with at least 25 percent of their snaps from the slot.